The source for damaging winds is well understood and it begins with the downdraft. As air rises, it will cool to the point of condensation where water vapor forms tiny water droplets, comprising the cumulus cloud we see. Near the center of the updraft, the particles begin to collide and coalescence forming larger droplets. This continues until the rising air can no longer support the ever increasing size of water drops. Once the rain drops begin to fall friction causes the rising air to begin to fall towards the surface itself. Also, some of the falling rain will evaporate. Through evaporation heat energy is removed from the atmosphere cooling the air associated with the precipitation. As a result of the cooling, the density of the air increases causing it to sink toward the earth. The downdraft also signifies the end of the convection with the thunderstorm and its subsequent decrease. When this dense rained-cooled air reaches the surface it spreads out horizontally with the leading edged of the cool air forming a gust front. The gust front marks the boundary of a sharp temperature decrease and increase in wind speed. The gust front can act as a point of lift for the development of new thunderstorm cells or cut off the supply of moist unstable air for older cells. Downbursts are defined as strong winds produced by a downdraft over a horizontal area up to 6 miles (10 kilometers). Downbursts are further subdivided into microbursts and macrobursts. As aircraft descend (above)(below) into the airport they follow an imagery line called the "glide slope" (solid light blue line) to the runway. 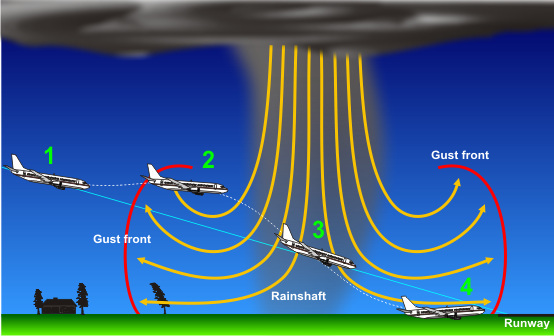 Upon entering the microburst, the plane encounters a "headwind", an increase in wind speed over the aircraft. The stronger wind creates additional lift causing the plane to rise above the glide slope. To return the plane to the proper position, the pilot lowers the throttle to decrease the plane's speed thereby causing the plane to descend. As the plane flies through to the other side of the microburst, the wind direction shifts and is now a "tailwind" as it is from behind the aircraft. This decreases the wind over the wing reducing lift. The plane sinks below the glide slope. However, the "tailwind" remains strong and even with the pilot applying full throttle trying to increase lift again, there may be little, if any, room to recover from the rapid descent causing the plane to crash short of the runway. How a downburst can impact a landing aircraft. Since the discovery of this effect in the early to mid 1980's, pilots are now trained to recognize this event and take appropriate actions to prevent accidents. Also, many airports are now equipped with equipment to detect microbursts and warn aircraft of their occurrences. A macroburst is larger than a microburst with a horizontal extent more than 2½ miles (4 km) in diameter. Also a macroburst is not quite a strong as a microburst but still can produce winds as high as 130 mph (210 km/h). Damaging winds generally last longer, from 5 to 20 minutes, and produce tornado-like damage up to an EF-3 scale. In wet, humid environments, macrobursts and microbursts will be accompanied by intense rainfall at the ground. If the storm forms in a relatively dry environment, however, the rain may evaporate before it reaches the ground and these downbursts will be without precipitation, known as dry microbursts. In the desert southwest, dust storms are a rather frequent occurrence due to downbursts. 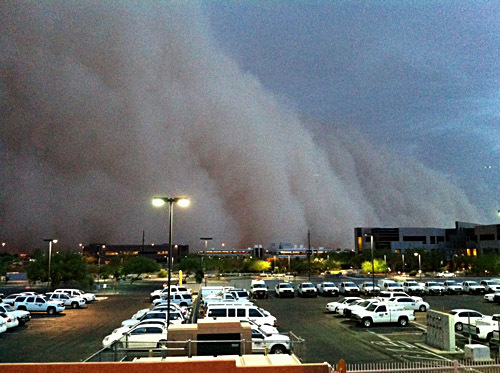 The city of Phoenix, AZ typically has 1-3 dust storms each summer due to the cooler dense air spreading out from thunderstorms. On July 5, 2011, a massive dust storm resulted in widespread areas of zero or near zero visibility in Phoenix. The wind that produced this storm was generated by downbursts from thunderstorms with winds up to 70 mph (110 km/h). Dry downbursts are responsible for a rare weather event called "Heat Bursts". Heat bursts usually occur at night, are associated with decaying thunderstorms, and are marked by gusty, and sometimes damaging, winds combined a sharp increase in temperature and a sharp decrease in dew point (humidity). The process of creating a dry microburst begins higher in the atmosphere for heat bursts. A pocket of cool air aloft forms during the evaporation process as for any downburst. But as the precipitation falls it evaporates before reaching the ground. The cool dense air sinks by the pull of gravity but since there is no rain drops to absorb heat, the air then warms due to compression. In fact, it can become quite hot and very dry. Temperatures generally rise 10 to 20 degrees in a few minutes and have been known to rise to over 120°F (49°C) and remain in place for several hours before returning to normal. One such heat burst occurred in Wichita, KS on June 9, 2011. If the atmospheric conditions are right, widespread and long-lived windstorms, associated with a band of rapidly moving showers or thunderstorms, can result. The word "derecho" is of Spanish origin, and means straight ahead. A derecho is made up of a "family of downburst clusters" and by definition must be at least 240 miles in length. Learn more about derechos.